In pursuance of the earlier notification dated 18.06.2013 regarding mandatory registration with DVAT Department and as informed in our previous communication titled “DVAT UPDATE : SECURITY ON REGISTRATION DONE AWAY WITH” WEF 01.07.2013 E filing of DVAT 04 shall become mandatory. Now in partial modification to that notification, another Notification No. 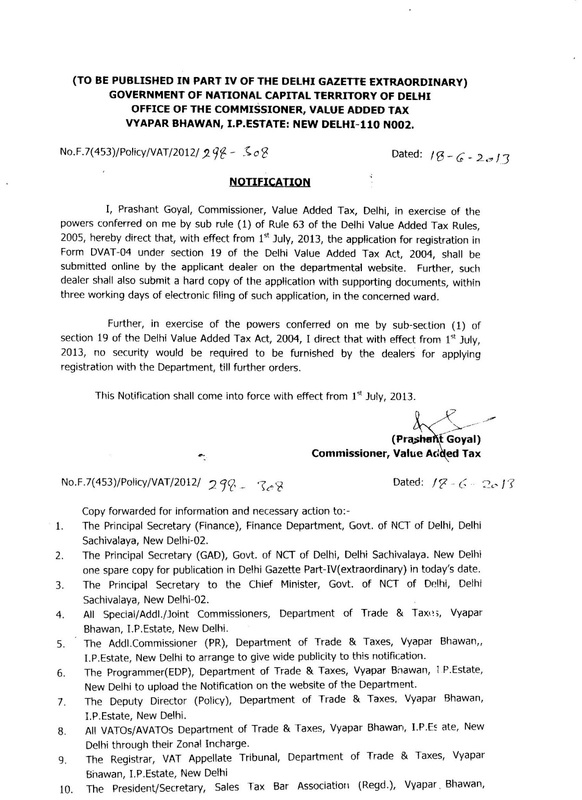 F.7(453)/Policy/VAT/2012/339-349 has been issued which makes it mandatory to E-file the following forms along with DVAT 04 where ever applicable at the time of registration. Application Form for opting Composition by an eligible works contractor in respect of scheme as notified by Government under sub-section (12) of section 16. 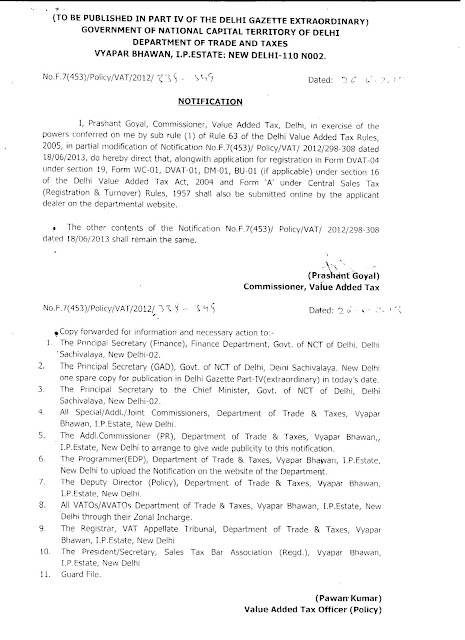 The Trade and Taxes Department Delhi has issued a notification dtd. 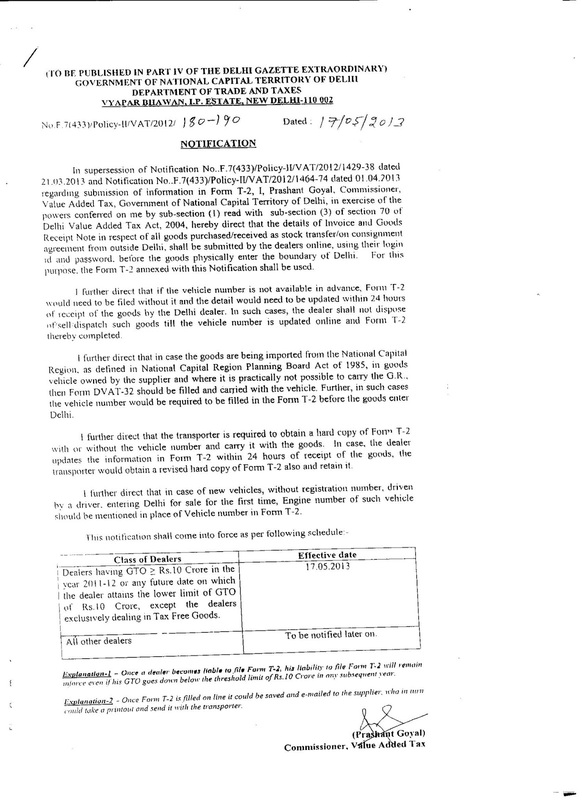 17/05/2013 clarifying the requirements with regard to Form - T2 applicable to Purchasers/ Importers/ Dealers who are receiving goods from outside Delhi. Rs. 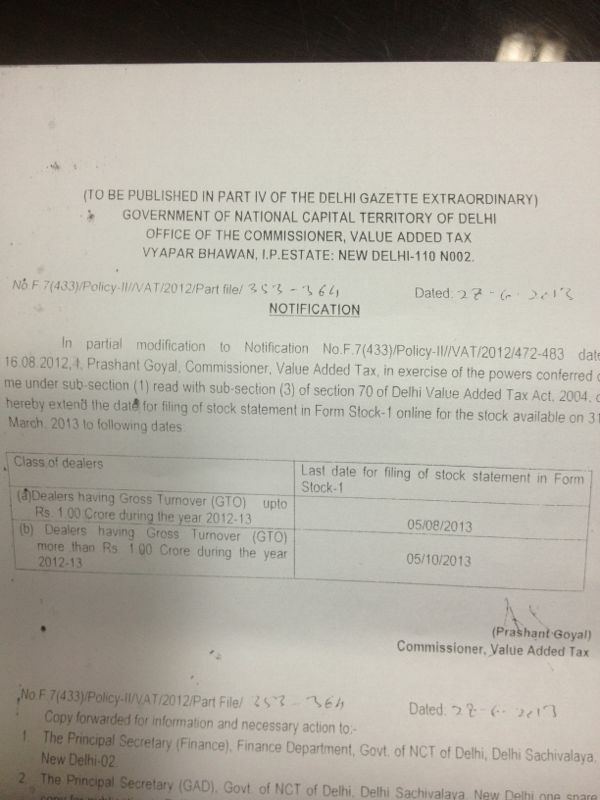 10 crores in the FY 2011-12. 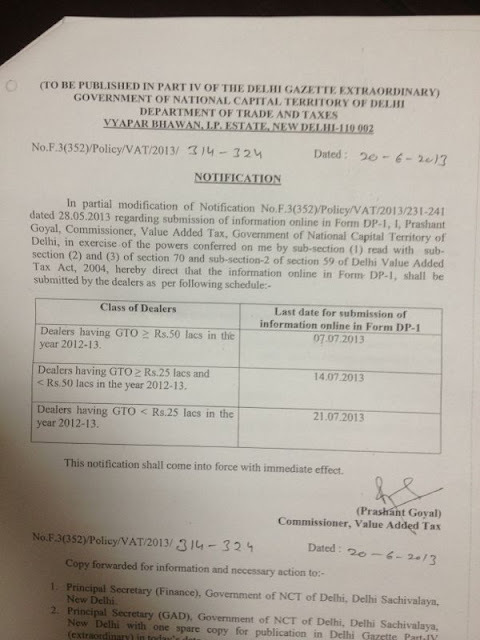 Dealers dealing exclusively in Tax Free Goods need not file T2. What if the turnover was not 10 crore in 2011-12 but exceeds limit in any subsequent year? T-2 shall become applicable from such subsequent year in which T/o exceeds Threshold limit. 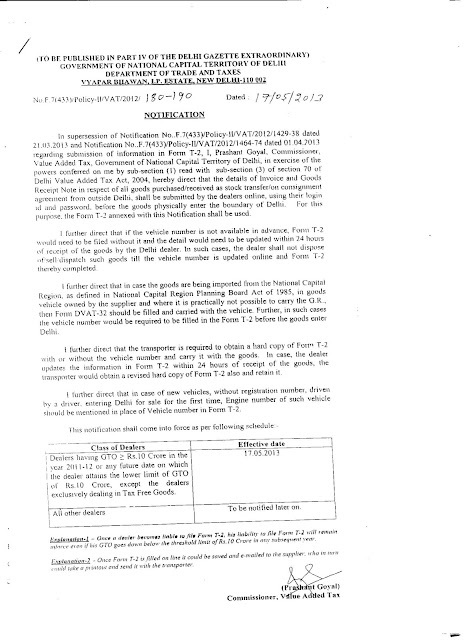 And then in subsequent FYs T/o is below 10 Crores what is the liability regarding T-2? Once the dealer becomes liable he shall have to file T-2 for all times to come. Details of Goods which are required to enter the state of Delhi for any reason i.e Purchase, stock transfer, consignment, branch transfer. before the goods enter the boundary of Delhi. What if I don’t have the Vehicle number right now? Then revise within 48 hours of the goods entering Delhi and provide vehicle number. Fill Form DVAT-32 and carry a copy of the same with the vehicle. and option to report within 48 hours is not available. with or without the vehicle number and carry it in the vehicle with the goods. Where the vehicle number is reported in the next 48 hours the transporter is required to take the copy of the revised Form -T2 and retain it. 1st day of July, 2013. 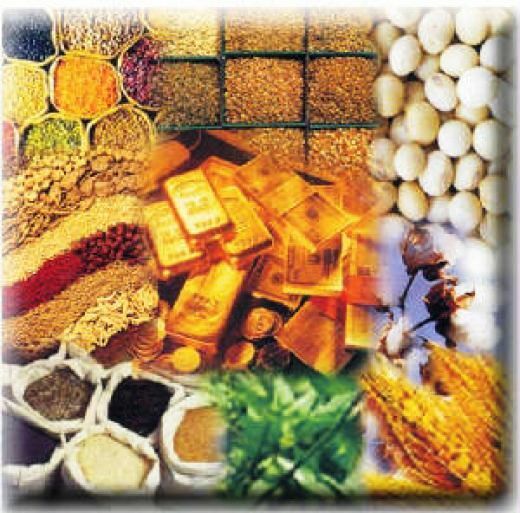 Value of taxable commodities transaction, commodities transaction tax, etc. 2. Electronically under digital sign. (c) the return shall be accompanied by a certificate regarding clean and virus free data. On or before the 30th June immediately following that financial year. (ii) in any other case, by the principal officer thereof. · With Trade and Taxes Dept., till further orders. taxable service has been provided or agreed to be provided. CBEC from time to time issues Notification to notify rate of exchange determined by it. Please find enclosed herewith the Notification No. 59/2013 dated June 06, 2013 containing the Rates of Exchange applicable from June 07, 2013. In exercise of the powers conferred by section 14 of the Customs Act, 1962 (52 of 1962), and in super session of the notification of the Government of India in the Ministry of Finance (Department of Revenue) No.54/2013-CUSTOMS (N.T. 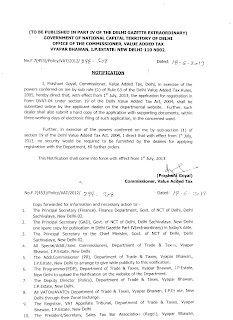 ), dated the 16thMay, 2013 videnumber S.O.1121(E), dated the 16 th May, 2013, except as respects things done or omitted to be done before such super session, the Central Board of Excise and Customs hereby determines that the rate of exchange of conversion of each of the foreign currency specified in column (2) of each of Schedule I and Schedule II annexed hereto into Indian currency orvice versa shall, with effect from 07 th June, 2013 be the rate mentioned against it in the corresponding entry in column (3) thereof, for the purpose of the said section, relating to imported and export goods.